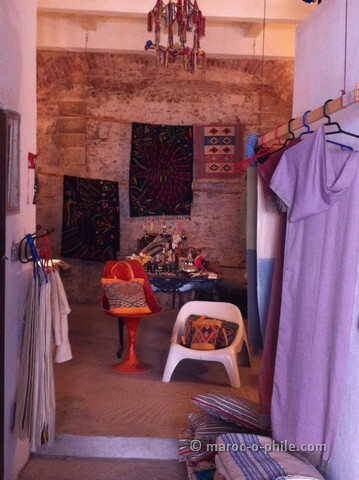 The team at Histoire de Filles and – new for summer 2014 –Coin des Saveurs., have got style in Essaouira nailed. The former stocks all manner of modern takes on Moroccan design, including homewares, accessories, clothing and much more. Designers are all Moroccan or Morocco-based. Check out the scarves by local Australian crafty woman, Colleen Cassar. Colleen reinvents silk, cotton and wool scarves from the local flea market as beautiful, upcycled floaty treasures – perfect for fending off Essaouira draughts! Even the shop’s decorations are for sale! Coin des Saveurs next door is rapidly becoming the go-to destination for culinary souvenirs. Why get your spices in a grubby plastic bag in the souk, when you can get them in a mini-Kilner jar along with a “Keep Calm & Eat Tajine” tea towel? Visit both shops in Rue Mohammed ben Massaoud. French artist and collector Patrick has finally opened this artisan’s workshop and showroom in the ground floor of his 18th century riad. The plan is that a cafe will soon follow. 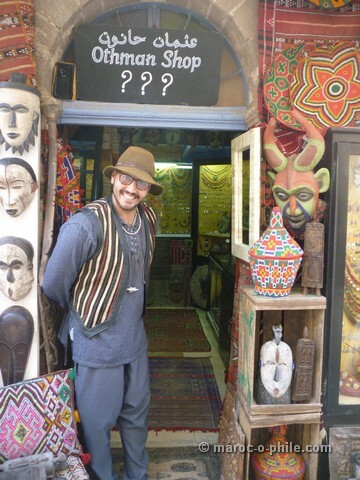 Patrick sells local art, rescued and upcycled ceramics and furniture and a range of jewellery and home wares made from thuya. Thuya (a confider of the cypress family) is indigenous to Essaouira and you will see boxes and furniture made from it all over town. Patrick has found artisans, carpenters and cabinet makers willing to break from the norm of highly varnished pieces with intricate marquetry inlays. This collaboration has resulted in bangles, rings, bread boards, stools and ornaments in a meticulously designed, sanded style which allows the grain and knots of the wood to tell their own story. Instead of the smell of varnish or oil, Patrick’s boutique offers a waft of the delicate scent of freshly sanded thuya. Az-Zahr is tucked away down Rue Mohamed Diouri. Essaouira’s Sunday joutiya (flea market; the name comes from the French ‘jeter’, to throw away) in the industrial quarter is great for rummaging. Come here to pick up bargains such as camel or goat hair blankets, second hand kaftans, ceramics, decorative items and remodelled furniture, plus all kinds of half-broken, dusty junk. Venture into the alleyways behind the market to find the shack workshops of some of Essaouira’s most current naive artists such as Baki and Asma. Self-taught, their work (on canvas, furniture and sculptures) uses bright, primary colours and is reminiscent of the indigenous art of other cultures. Find the joutiya in the area between the Jewish cemeteries and the Asswaj Assalam supermarket. Business woman Hafida set up her own shop in 2013 after managing the boutique at Taros for years. She is now in her second location and has never looked back. She welcomes all her customers with a broad smile and offers a carefully curated selection of jewellery, accessories, small paintings, and other decorative items made by Moroccan and locally-based artisans. The stand out stars of her collection, however, are her leather shoulder bags and clutches in a wide range of on-the-minute colours. Basma Shop is on the Skala – head around the ramparts from the main square (Place Moulay Hassan) and look for the smiley sign. When you shop at Mashi Mushki in the impoverished Chbanate neighbourhood of the Essaouira medina, you are helping make a difference to local lives. 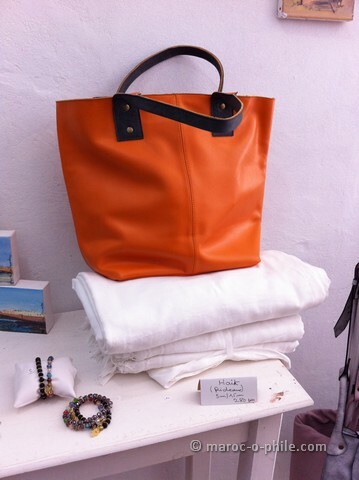 Many of the items are made by local women or coops and a percentage of the profits goes to the Project 91 charity. Funds support local young people to get skills and training (such as a hairdressing qualification, English language or driving lessons). The P91 campaign, “Leave your wardrobe in Morocco”, encourages tourists to leave clothes behind for sale in the P-91 charity shop on Rue Tetouan. You can donate unwanted clothes at the shops or participating riads. The Mashi Mushki shop is on Rue Chbanate under Dar 91. Did you like this article? Download my e-guide, The Best of Essaouira, for more inside tips on Morocco’sboho-chic seaside resort. Can I buy online the hooded cotton sleeveless tops they sell in Morocco? If so, please tell me where! I am not sure I know what you mean. Where have you seen them? Do you have a picture. If you send me a picture, I might be able to put you in touch with a manufacturer, depending on how many you want. In general, it is easier/cheaper to order something directly from a manufacturer or retailer in Morocco. If someone has discovered something and it’s trending in Europe, it will be doing so at several times the price.